Getting rid of clutter on your roof is tough, If it wasn’t everyone would have these surfaces swept off regularly. Build up of debris or moss growth is an ordinary occurrence around the Sylvan Lake area but it doesn’t need to be. When your roof begins to collect unwanted items, an Sylvan Lake roof cleaning and moss removal can clear areas away. 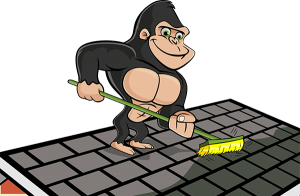 When our Gorillas arrive on the scene for your Sylvan Lake roof cleaning and moss removal, they begin a multi-step process. By first assessing the condition of the outer areas of your property, our Gorillas can spot any safety concerns before they become a hazard. Once the area is secured, our Gorillas get to work, hitting the heights of your home or business. It might look scary from the ground, but our Gorillas always operate insured while using all the proper stand-offs and safety equipment. It can be difficult to predict just what it is that is cluttering up your roof but with years of experience behind us, our Gorillas are ready for anything! One of the biggest threats to the condition of roofs in the Sylvan Lake area is moss. As moisture levels rise, the clutter on your roof hSylvan Lake on to it. This dampness against the surface of your roof allows moss to grow and begin to spread. The long that your roof is cluttered, the easier it is for moss to spread and the more difficult it is to see. Instead of simply pushing clutter from your roof to your lawn, our Gorilla ensure that everything is taken away properly. Once this surface layer is removed, our Gorillas have a clear view of any and all moss growth. Instead of leaving our clients in the dark about what is happening on their roof, you can stay up to date with photos. Each and every Gorilla has a smartphone with them that allows clients to see the before, after and condition of your roof.